At long last, it is here: our first proper look at the final episodes of HBO’s Game of Thrones. And while it doesn’t really give us a lot to go on other than the fact that every single character on the show is contemplating their inevitable icy end, there’s still a few nuggets of information to parse. 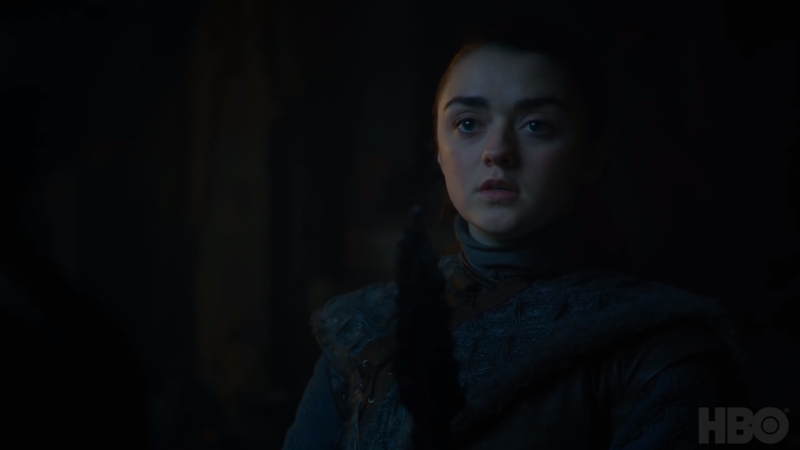 The trailer opens with a bloody, exasperated Arya Stark (Maisie Williams)—in a near-pitch-dark corridor at Winterfell. 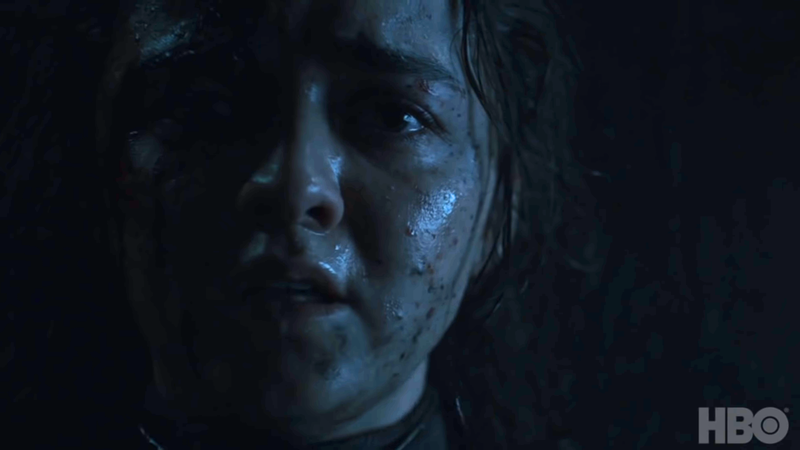 A lot—a lot—of this trailer is very darkly lit, but if you brighten it up a little you can see that Arya’s got a pretty nasty gash on her forehead, blood seeping all over her right eye. 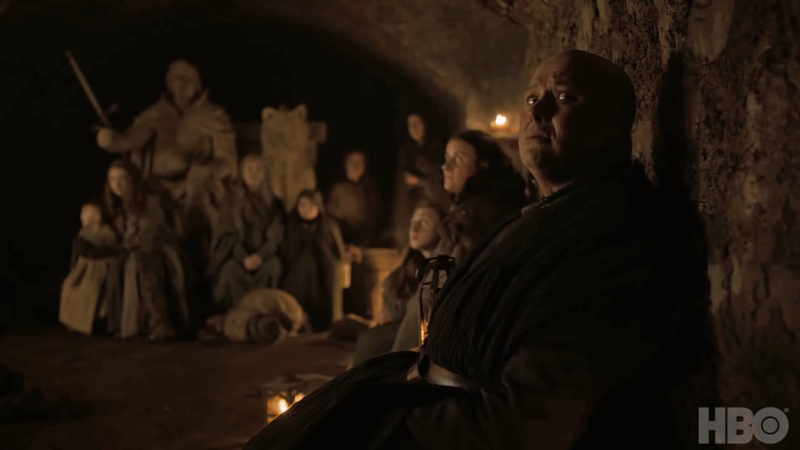 ...and meanwhile, Varys is hiding out in Winterfell’s underground crypt with the women and children of the castle. Which is a very Varys thing to do, after all, as this is obviously an early glimpse of what we now know is the Battle of Winterfell: a massive clash between the Night King and his White Walker hordes and the united forces of Daenerys Targaryen (Emilia Clarke) and the Stark family. But then we cut back to Arya, this time pre-head wound, as she contemplates a dragonglass knife. “I look forward to seeing this one,” she concludes. Running theme of this trailer? Everyone knows everything’s gone to hell, and they’re kind of accepting of it. Elsewhere in the land of much better lighting, a Greyjoy fleet sets sail. But note: the men aboard it are not your typical Iron Islanders—after all, they’re all clad in golden armour, and led by someone who doesn’t look like any of the Greyjoys we know. 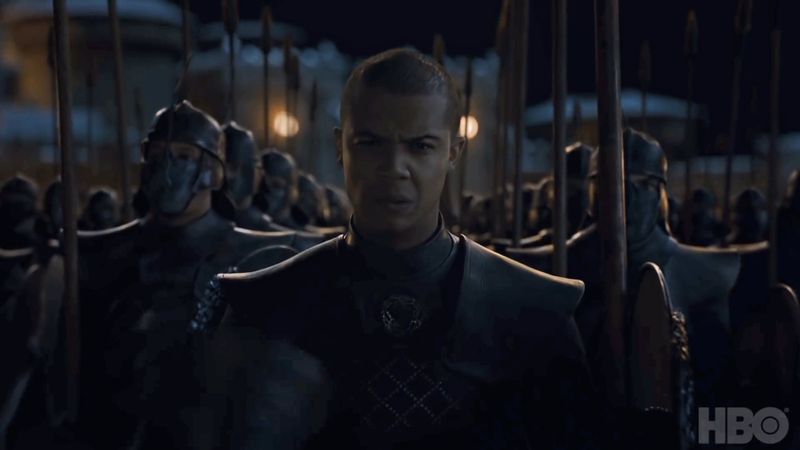 At the end of season seven, Cersei (Lena Headey) mentioned to Jamie (Nikolaj Coster-Waldau) that Euron Greyjoy was heading to Essos to recruit the mercenary force known as the Golden Company to bolster Cersei’s forces, whether it’s in a fight against the White Walkers or a fight against Dany coming for her throne. These are presumably the Golden Company then, given the aesthetic, lead by a new character we’ve not seen before. Unless Euron decided to get in the mood and grow out his hair and slick it back a bit. The next shot in the trailer may be the closest thing to new information it really gives us: TORMUND (Kristofer Hivju) LIVES, YOU GUYS. Yes, everyone’s favourite fire-kissed wildling bro seemed like he was in a dire place at the climax of the last season, considering he was literally on the Wall when the Night King used zombie Viserion to bring it all tumbling down. Joining him in the “I Survived the White Walker Invasion at Eastwatch-By-Sea and All I Got Was This Lousy T-Shirt” club are Edd (Ben Crompton) and Beric Dondarrion (Richard Dormer), who lights the way with his flaming sword. 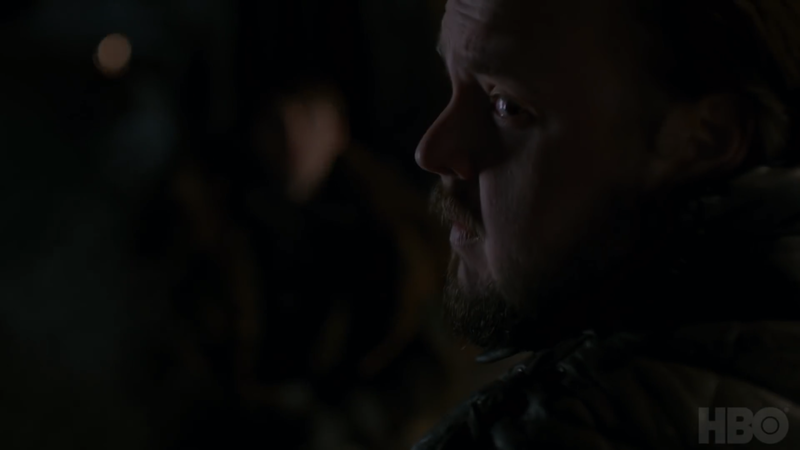 Back to misery land up in Winterfell, where Bran (Isaac Hempstead Wright) and Sam (John Bradley) briefly exchange terse looks with each other. 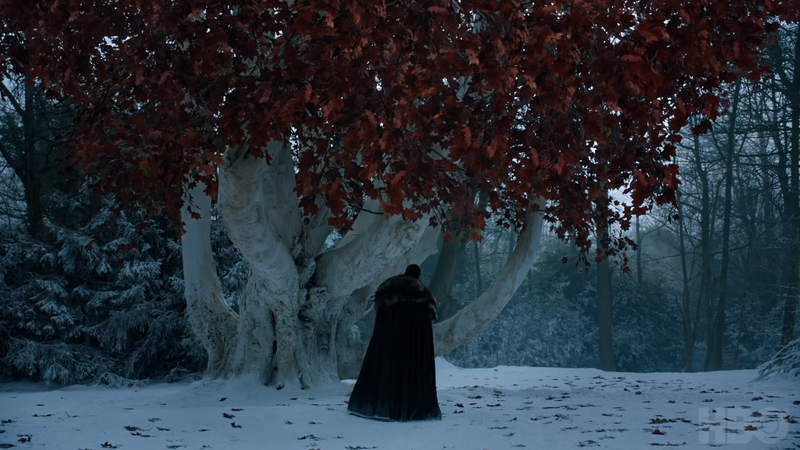 A lot of this trailer seems to be taken from a “calm before the storm” episode that takes place before the Battle for Winterfell, which will be directed by series veteran David Nutter. The battle itself will of course get its own episode, directed by Miguel Sapochnik, the director behind the massive battles in “Hardhome” and “Battle of the Bastards.” Over all these shots, Bran—presumably talking to Jon (Kit Harington), but it could be to any of his remaining siblings in context really—offers the closest thing to reassurance he can: “Everything you did brought you where you are now. Where you belong. Home.” That’s all well and good Bran, but home’s about to be assaulted by ice zombies! Who’s not miserable (at least not yet), though? Cersei, who’s back down in King’s Landing where everything is shot in actual daylight and is nice and visible, and smirking to herself at the docks alongside Maester Qyburn (Anton Lesser). Given the shot of Euron’s fleet earlier, maybe she’s witnessing the arrival of the Golden Company to help tighten her grip on the Iron Throne. Back in the North, a young boy watches the Unsullied march back from an outlying village to Winterfell proper, lead by Dany and Jon, presumably in preparation for the battle to come. As this is the first time we see them in the trailer, fun reminder from last season: they boinked (ill-advised)! And are related (super ill-advised)! Ah, Game of Thrones. Sansa (Sophie Turner) watches them return, as Rhaegal and Drogon soar overhead. This is presumably after Dany and Jon have returned from their ill-fated attempt at convincing Cersei to team up against the White Walkers in the season finale, which is why Sansa is not immediately as miserable looking as 90 percent of the characters in this trailer. But we do know that at some point in the season Dany and Jon do seemingly venture on another escapade of their own, and this could be them returning from that—more on that in a bit. ... Before sharing what could be a final kiss. Awww. But hey, now that all the lovey-dovey stuff is out of the way, it’s time for the battle for Winterfell to begin! 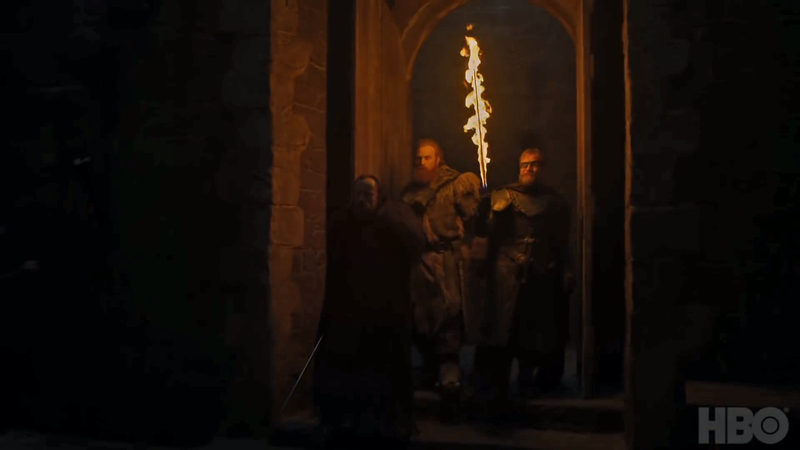 And our first real shot of the action in this trailer reveals a very intriguing arrival on the scene: Jaime Lannister, having left Cersei behind at the end of season seven, has made his way to the action. As if to hammer home that divide between the Lannisters, we cut back to King’s Landing, as Cersei holds a rather empty audience with an unknown figure (it’s hard to tell if this is that Gold Company commander from earlier, or perhaps Euron, or someone else), before tearily enjoying a cup of wine all by herself. What’s the point of a throne to rule if the brother you have an incestuous relationship with isn’t there to share it? And also if a bunch of undead ice monsters could be about to come and kill everyone? Here’s your pre-requisite “look at our VFX budget” shot of Rhaegal and Drogon. Pretty! But noteworthy that they’re very clearly further up north than Winterfell here, and likely beyond the Wall. Not like it was insurmountable by a dragon before, but now that there’s a giant hole in it, much easier to traverse to. Speaking of Dragons, we cut back to what is presumably paired with the earlier shot of Sansa, the Dragons returning to Winterfell—or rather we see it from Arya’s perspective now, the first time she’s ever actually seen Dany’s brood in person. She’s rather enamoured, unlike literally everyone around her. Meanwhile, Jon pays a visit to the Godswood at Winterfell, presumably after his return from the ill-fated parlay with Cersei. 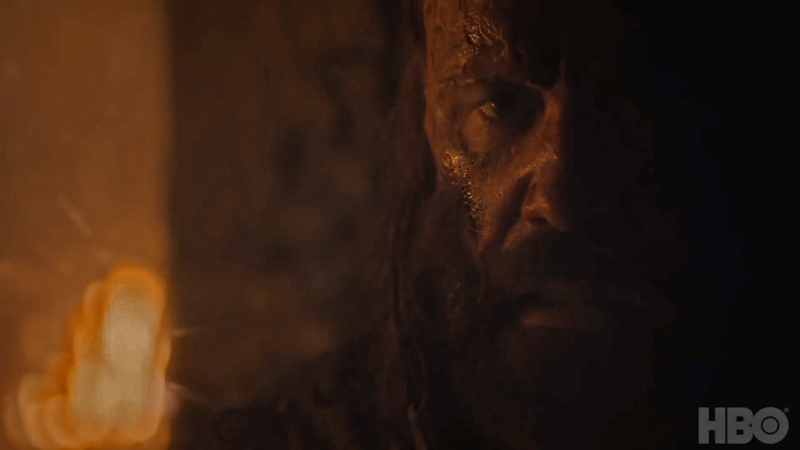 But back to the bloodshed to come though: we get this ominous, fire-tinged shot of another guest participant at the battle at Winterfell against the Night King: The Hound (Rory McCann)! Jon steels himself to face the ultimate fight of his life, as the Battle for Winterfell truly begins. But before (or maybe even after) all that, we finally see the connection between the earlier shot of Rhaegal and Drogon beyond the Wall and the recently released pictures of Dany and Jon in similar environs: At some point this season, whether it’s before or after the massive scrap at Winterfell Keep, the duo ventures past the ruins of the Wall. What are they looking for—answers? More ways to end a second Long Night? Some Targaryen family bonding time? The dragons have at least found something to flame broil in the meantime. The trailer ends in the manner in which most of it progressed: shots of our heroes looking distraught and a teeny bit more of the action from the battle for Winterfell. First, the despair: Here we’ve got Sansa (so this is presumably after she’s learned the meeting with Cersei didn’t go well), Tyrion (Peter Dinklage, in our one and only look at him in this trailer), and then Dany. Everyone is so tired and miserable, you’d think it’s the end of the world as they know it. But then here’s the isolated shot of the action from the battle, only because, hey, look, it’s Arya! Finally getting to participate in her very own giant Game of Thrones battle after missing out on all the past ones. And it seems that dragonglass dagger from earlier might now be a dragonglass spear. That’s fun. After a brief blast of dragonfire, the trailer ends with the most ominous of all shots: the gathered forces at Winterfell, including Brienne (Gwendoline Christie) and Podrick (Daniel Portman), as they come face to face with the first skeletal hoof of the Night King’s vanguard. After all that build up, after all that despair, it’s time for the Battle of Winterfell to truly begin. Understandably, at this point, HBO is keeping as much close to its chest as it possibly can when it comes to Thrones’ final season. 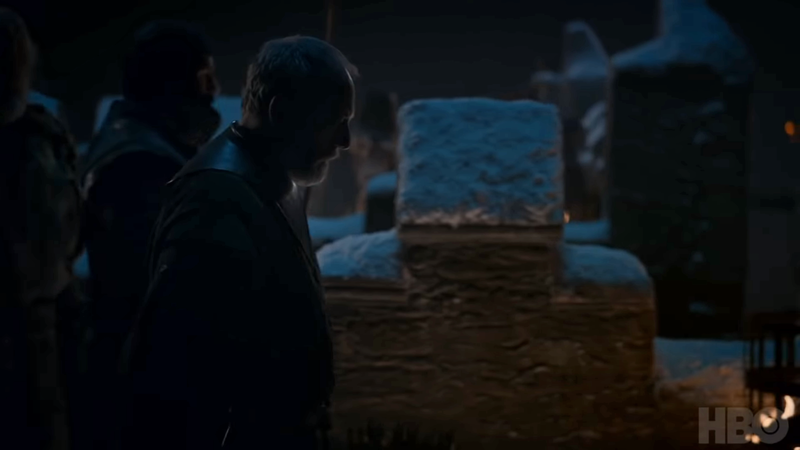 This trailer, while incredibly dense, doesn’t really tell us anything beyond things we already knew were coming, like the massive battle at Winterfell. It’s mostly a tonal piece rather than a trailer packed with reveals—a dire portent that what’s coming is not just the fight of our heroes’ lives, but the end of it all. The end begins when Game of Thrones returns April 15.